1. Remove the upper intake manifold. 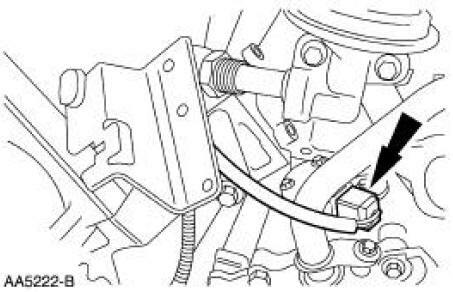 For additional information, refer to Upper Intake Manifold in this section. 2. Partially drain the cooling system. For additional information, refer to Section. 3. Relieve the fuel system pressure. For additional information, refer to Section. 4. Disconnect the fuel rail pressure (FRP) sensor electrical connector and vacuum hose. 5. Disconnect the fuel supply tube spring lock coupling. For additional information, refer to Section. 6. Disconnect and position the engine wire harness aside. 7. Disconnect the intake manifold runner control (IMRC) electrical connector. 8. Remove the heater bypass tube. For additional information, refer to Section. 9. Disconnect the heater hose. 10. Disconnect the exhaust gas recirculation (EGR) vacuum tube. 11. Disconnect the EGR tube from the EGR valve. 12. Disconnect the radiator upper hose and coolant bypass hose. 13. Disconnect the electrical connector. 14. NOTE: Remove the fuel injection supply manifold and fuel injectors as an assembly. Remove the bolts and the fuel injection supply manifold. 15. NOTE: For ease in installation, record the location of the short bolts and the long bolts. 1. Remove the eight short bolts. 2. Remove the six long bolts. 3. Remove the lower intake manifold. 16. Remove and discard the intake manifold gaskets.